Approximately one in five New Yorkers lives in poverty and nearly half the city’s households are considered near poor. Employment data and the city’s food banks tell us that the number of working poor continues to rise. We focus on policies to help families maximize income and access public benefits and services, including raising minimum wage and job quality issues, expanding tax credits, and access to affordable child care and other work supports. We are also examining the racial disparity in wealth and strategies to temper hardship caused by fluctuations in earnings and expenses. 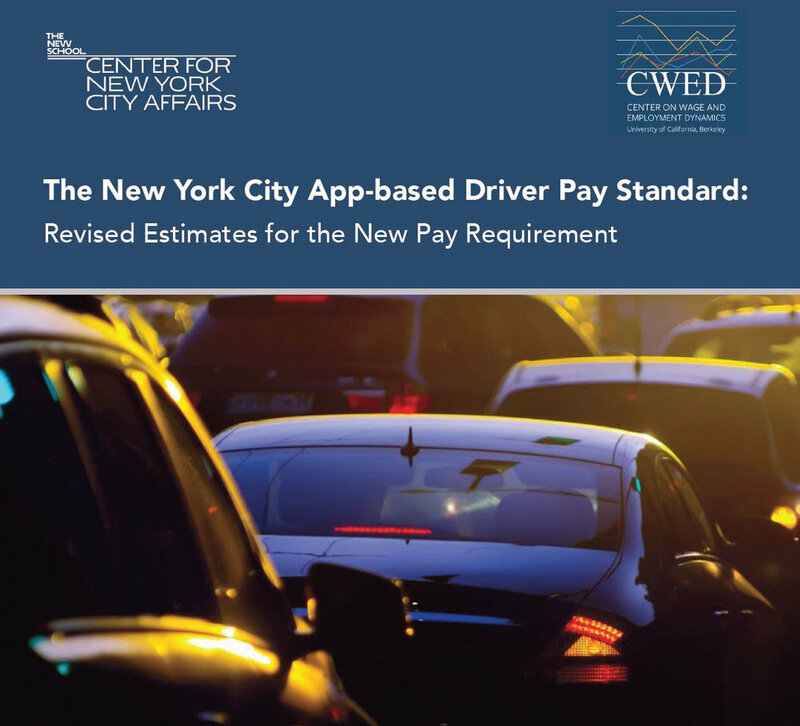 This brief provides an update to the report that Parrott and Reich issued in July 2018, "An Earnings Standard for New York City’s App-based Drivers: Economic Analysis and Policy Assessment,” and informs the final pay standard as incorporated in the Driver Income and Transparency Rules, adopted by the New York City Taxi and Limousine Commission (TLC) on December 4, 2018. The new pay standard takes effect February 1, 2019. CNYCA partners with the Workforce Field Building Hub, an initiative of the NYC-based Workforce Professionals Training Institute (WPTI) on the Monitoring the Minimum Wage issue brief series. The briefs are intended to track the implementation of the $15 minimum wage in New York City by engaging businesses, workers and workforce practitioners, and by assessing the impacts in other jurisdictions around the country. Monitoring the Minimum Wage: Brief 3 on lessons from other cities is available here. Previous issues in the series are available here. New data for 2016, released by the U.S. Census Bureau last week, shows continued healthy gains in median family incomes and significant drops in poverty, especially childhood poverty, in New York City. The Census Bureau found that real median family income in New York City rose 5.2 percent in 2016, and is up 9.5 percent since 2013. Real median family income in the city had fallen by 5.2 percent from 2008 to 2013, during and after the Great Recession. The 2016 median family income level of $65,440 was 3.8 percent greater than the 2008 level (expressed in 2016 dollars). Most affluent New Yorkers don’t think twice before ponying up $2.75 to ride the subway or bus. But for the working poor, it’s another story. It is well known that women in the U.S. are paid, on average, 77 cents for every dollar that a man earns. We discuss: what is the nature of the pay gap and why does it exist; who is affected the most; and what policy initiatives can be taken to close the gap? Many social service programs aim to get young people ready for work. Not enough hire them. As important as education and training are, they often fall by the wayside for young people living in poverty, lost in the unending immediate need for funds to survive and support a family. Without a job to provide those funds, inevitably, many young people turn to a shadow economy – and that often leads to a criminal record. Once that spiral has begun, opportunities for legitimate employment become few and far between. Opportunities for meaningful employment are almost nil. A professor of economic policy analysis at The New School, Dr. Teresa Ghilarducci is a nationally recognized expert on retirement policy. She recently talked with Urban Matters about the proposal by her and others to close retirement savings shortfalls by creating guaranteed retirement accounts. Wealth – the value of what you and your family own minus what you owe – matters. A lot. Wealth is, in short, the paramount indicator of future economic success. The rationale for the higher minimum wage is clear: Since the end of the Great Recession, the majority of job growth in New York, a notoriously high cost-of-living environment, has been in low-wage employment. While organized labor and its allies have pushed the "Fight for $15" in response, others have voiced concerns that such raises may result in job losses or stymie entrepreneurship. Is a dramatic raise in the minimum wage the best way to help low-income workers in New York? A conversation with Manuel Pastor that explore questions such as: what are the national demographic shifts and their impact on our country and the economy? What is the “uncommon common ground”? How can policies be used to advance an inclusive agenda that works for all? How can we keep children in city-subsidized shelters safe? How can we use the time they spend in shelter to foster rather than derail their development? How can we support parents who are leaving shelters that may be the only homes their children have known? The War on Drugs has created a powerful surveillance state in America's most disadvantaged neighborhoods. High-tech techniques criminalize entire blocks and transform informal community networks into liabilities for local residents as police use family relationships to demand information, pursue suspects and threaten incarceration. The presumption of criminality takes a relentless toll. Alice Goffman, assistant professor of sociology, University of Wisconsin-Madison; author, On the Run: Fugitive Life in an American City. Jeff Smith, assistant professor of politics and advocacy, Milano School of International Affairs, Management, and Urban Policy, The New School. Jamelle Bouie, politics, policy, and race reporter, Slate. A FDIC study finds that seven of every 20 New York households is underbanked. New York and other cities and states are experimenting with solutions, including low- or no-fee community banking services and financial literacy campaigns. What works? And what should government, nonprofits, and the banking sector do now? Some critics blame the Community Reinvestment Act for the mortgage meltdown that prompted the current deep recession. Others point to the abuses of subprime lending and Wall Street manipulation. Yet questions about the impact of the economic collapse on African American communities—and about the future of neighborhood stability, consumer access to credit, and the role of race in public policy—remain unanswered. As the federal government acts to reverse the economy's decline, what have we learned, and what does the future hold? Hon. Maxine Waters, U.S. Representative (D-Calif.); James Carr, COO, National Community Reinvestment Coalition; Sarah Ludwig, Executive Director, NEDAP; Louis Prezeau, President & CEO, City National Bank; Darrick Hamilton, Assistant Professor, Milano The New School for Management and Urban Policy. The libertarian model asserts that heavy state intervention in the economy is a threat to human liberty. But the recent history of market-based democracies has shown almost the reverse. The supposedly small-state model of the United States has instead opened the door to massive inequalities of income, wealth, and power. The state has not taken over business; alas, business has taken over the state. Considering the recent experiences of the United States, Scandinavia, and other market-based economies, how should we re-conceptualize the balance of state, market, and democracy?